Thank-you Chewy for sending these items for free in exchange for an honest review! 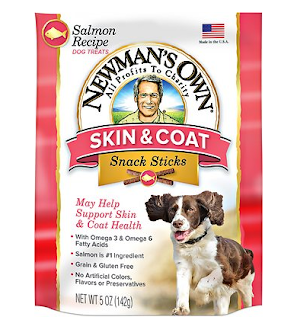 The two items I received were the Newman's Own Snack Sticks, and a cute collar. Every furbaby loves snacks, so we just know they'll enjoy the new Newman's Own Snack Sticks. Each formula has a unique purpose. All three are equally delicious, but are formulated for different needs. The chicken formula is packed with Glucosamine and Chondroitin, which helps with your furbaby's hip & joints. The salmon formula is full of omega-3 and 6 fatty acids, which help promote a strong and healthy coat. Lastly, the lamb formula is packed with tons of pumpkin, for easy digestion. Which one will your pup choose? If your pup likes to get into some muddy fun, this waterproof and easy to clean collar might be right up your alley! It’s made to withstand any type of weather, so it’s the perfect all-season collar, and it won't retain odor or stain your pet's coat. All the other dogs in the neighpawhood will be jealous when your baby is strutting on by in their Red Dingo Collar. Kiah was happy to have the lamb snack sticks to help with digestion. She immediately took the snack and gobbled it up and was eagerly waiting for another one. I can't recall her every eating lamb before and it was the number one ingredient and she is begging for more. This dog snack has no wheat, corn, corn gulten, or soy... which makes it safe if your dog is sensitive or has any allergies. This snack is also free from preservatives and no artificial flavors. It is so reassuring to me as a pet owner to give my dog a snack that is healthy for their digestion. I really tried to get a good picture of her eating her snack but that was a major fail. I know last month I had my husband try Kiah's dog treat and he is willing to do it again... however we have been hit with colds in our house so our taste buds are already out of whack. Don't let her pouty face fool you... she hates her picture being taken and she always acts like she is in trouble. She is a good girl and this collar is going to be a nice one that will be super easy to clean! 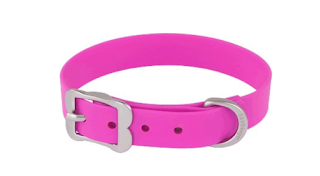 This collar is available in many other colors and sizes. I kinda wanted to go with the bright lime green but then my daughter reminded me that Kiah is a girl and needs girly colors! The price is great ranging from $5.99 to $15.99 depending on the size you order. This color is made of durable PVC coated webbing. It is easy to clean and it doesn't retain any smells! The idea of my dogs collar not getting stinky has me excited! The collar was easy to put on and my Kiah girl was excited for the new collar. She has adjusted to the new collar and even with it being the PVC and not fabric she is showing zero indication of it being uncomfortable or itchy!